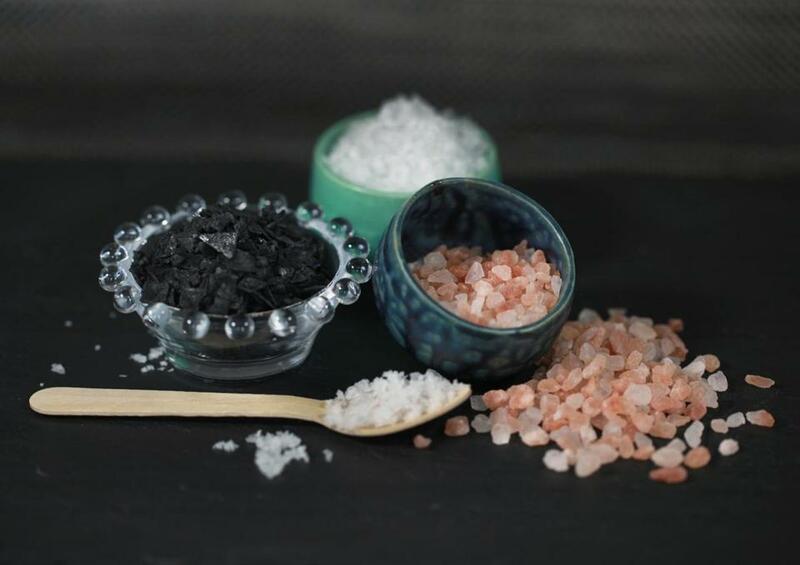 Clockwise from left front: Maldon Sea Salt (from England), Cyprus black sea salt, salt from Atlantic Saltworks in Gloucester, and Himalayan pink salt (mined in Europe and Asia). Last fall, longtime friends Heather Ahearn and Alison Darnell went to the farmers’ market in Salem to shop for dinner and realized that their entire menu was locally sourced — except for the salt. 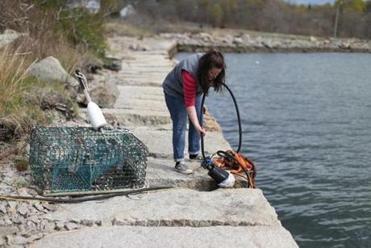 The industrious duo headed down to a quiet corner of Salem Harbor, filled a gallon jug with sea water, and set it on the stove to boil. Many hours later, there was salt in the bottom of the pot. “Once we saw that salt,” recalls Ahearn, “we didn’t turn back.” The pair’s venture, Atlantic Saltworks, was founded last year. The business partners joined the ranks of a small but growing group of artisan New England saltmakers, including Marblehead Salt Co., launched by Andrew Bushell, also last year, and the two-year-old Cape businesses, Cape Cod Saltworks in Orleans and Wellfleet Sea Salt Co. in Wellfleet. The senior entrepreneur in the group is Maine Sea Salt Co., of Marshfield, Maine, in business for 16 years. All these companies use the evaporation process to make salt, rather than harvesting salt from mines. 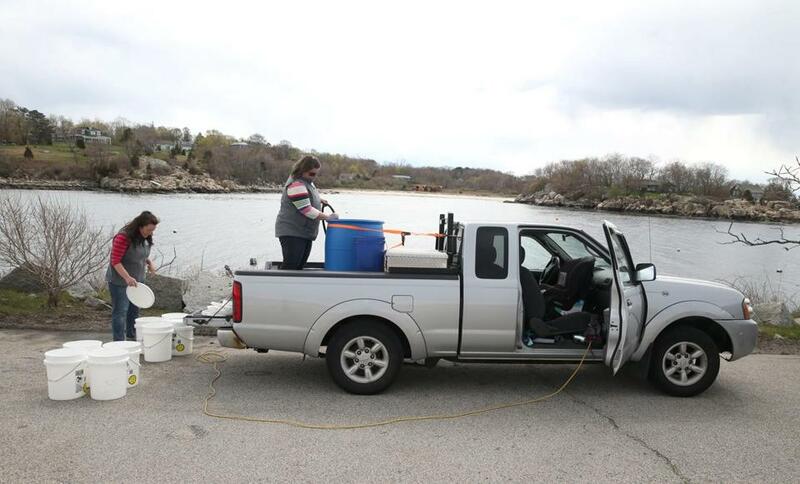 Atlantic Saltworks co-owners Alison Darnell and Heather Ahearn (right) collect seawater in buckets in Gloucester for boiling down to make their artisan salt. Darnell workig on artisan salt. Developing that flavor came after the entrepreneurs sampled seawater at 20 spots along the North Shore, from Swampscott to Newburyport. They settled on the waters off Gloucester. “The salinity was almost the same everywhere, but we were shocked at the differences in flavor,” says Ahearn. They will soon start construction on a production facility in Gloucester, thanks to a recent successful Kickstarter campaign. The owners collecting saltwater in buckets. In restaurants and home kitchens kosher salt has become the standard (its description as “kosher” comes from its use in the Jewish tradition of salting meat to draw out blood as part of the koshering process). Larger granules make kosher salt both easier to pick up with the fingertips, and to distribute evenly. And without the additives present in table salt, most notably iodine, kosher salt is often considered to have a cleaner taste. Natural salt fans, however, including author Bitterman, want to change this widespread preference for kosher salt. “Moving to kosher salt from iodized table salt is like moving from Twinkies to Ho Hos,” he argues. “They are both industrially processed foods.” Anyone who focuses on using unprocessed, whole ingredients, he says, should choose naturally occurring sea or rock salts. As with many trends, sea salts gained popularity because of their use by chefs. 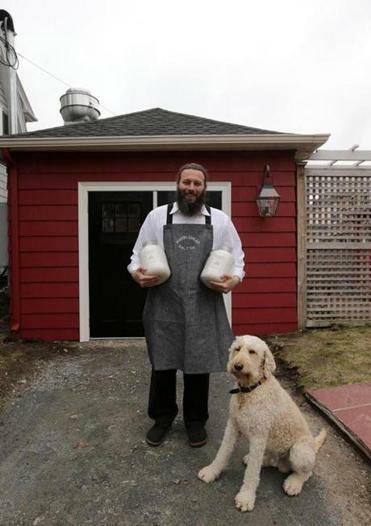 Matthew Tropeano, chef of Pain D’Avignon Cafe-Boulangerie in Hyannis, keeps bright white Maldon Sea Salt in his kitchen for finishing many dishes. “It’s beautiful flaky salt from England that chefs all over use.” He is also smoking Maldon salt in a cold smoker he fashioned from a discarded dishwasher. Andrew Bushell with his dog Theo, whose image is part of the label for Bushell’s Marblehead Salt Co. Bushell collects seawater from 14 locations off the Marblehead coast to create his sea salt. Salt Traders in Ipswich, a retail shop that offers a wide range of natural salts, has products from local producers and others sourced across the globe. Manager Yvonne Marsh sets up tastings to help customers find just the right one. “Salt is a very personal choice,” she says. “Each one has its own flavor and personality, and like clothes, you know when it fits you.” During a sampling, she contrasts the “gentle flavor with a firm crunch” of a coarse Himalayan pink salt with the “briny, but delicate texture” of a flaked Atlantic finishing salt. Any conversation about salt invariably turns to health. Current government guidelines recommend less than 2,300 milligrams of sodium daily (about one scant teaspoon of table salt). 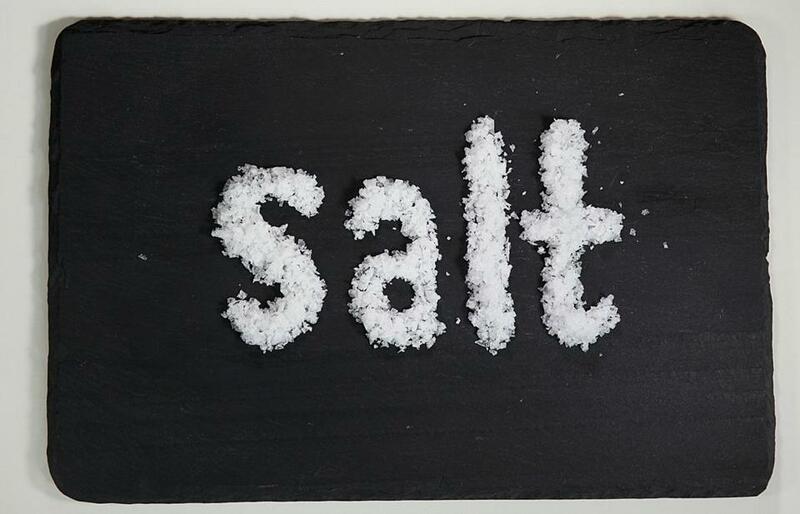 Deborah Krivitsky, director of nutrition for the Cardiovascular Disease Prevention Center at Massachusetts General Hospital, says there are new findings regarding salt. A recent collaborative study between Albert Einstein College of Medicine and Copenhagen University Hospital found that some people can tolerate between 2,600 and 5,000 milligrams per day (1 to 2 teaspoons) without an increase in cardiovascular disease. Krivitsky stresses that appropriate amounts of sodium for individuals depend on their health and lifestyle. She warns, “Many of us still eat too much salt . . . and most of that comes from processed foods.” She encourages cooking from scratch to control how much you consume. ATLANTIC SALTWORKS (about $6 for 1.5 ounces) is available at Pamplemousse, 26 Haven St., Reading, 781-872-1125; The Cave, 44 Main St., Gloucester, 978-283-0896; Lula’s Pantry, 5 Dock Square, Rockport, 978-546-0010, The Picklepot, 75 Wharf St., Salem, 978-744-6678; or go to www.atlanticsaltworks.com. MARBLEHEAD SALT CO. (about $5 per ounce) is available at Shubie’s, 16 Atlantic Ave., Marblehead, 781-631-0149; Vinnin Square Liquors, 371 Paradise Road, Swampscott, 781-598-4110, Formaggio Kitchen South End, 268 Shawmut Ave., Boston, 617-350-6996; or go to www.marbleheadsalt.com. SALT TRADERS 18D Mitchell Road, Ipswich, 978-356-7258, www.salttraders.com. Preserving lemons in a salt brine is an ancient North African technique. The bright fruits are quartered, generously salted, and tucked into sterilized jars filled with the juices from the fruit. For an additional layer of flavor, add peppercorns or cinnamon sticks. Pop them into the fridge and in several weeks, they will be transformed into a mild seasoning. Soaking dried beans in salted water before cooking helps weaken their skins, avoiding the crunchy bean phenomenon. Mix 2 to 3 tablespoons of salt with 1 gallon of water and let the beans soak at room temperature overnight (if you’re in a hurry, even a few hours in the salty bath will help soften them). Drain and rinse well before cooking. Some recipes instruct the cook to salt eggplant to draw out the bitter juices. In French, the technique is called “degorger.” After salting, you have to rinse the eggplant and dry it. Use the method to soften strands of raw zucchini that will not be cooked, and shreds of cabbage before making slaw. Many cooks add a pinch of salt to every confection to heighten the other flavors. Hawaiians salt pineapple before eating to bring out the sweetness, and others salt melons (particularly watermelon), mango, and guava. The French salt small radishes (and eat them with butter). 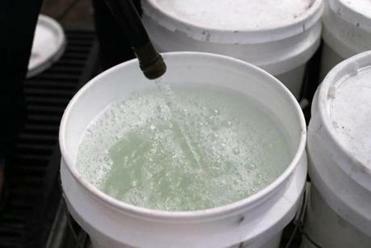 Table salt is mechanically mined, refined salt, usually with added iodine. The most common of the two types of kosher salt is mechanically mined and named for its use in preparing meats according to Jewish dietary laws. Less common are kosher-certified natural salts, such as the one made by Marblehead Salt Co., that meet Jewish dietary laws. Flake sea salt comprises thin, light, dry, and crisp crystals that vary in size and shape. This variety, as Maldon Sea Salt, crumbles easily and adheres to cooked food. 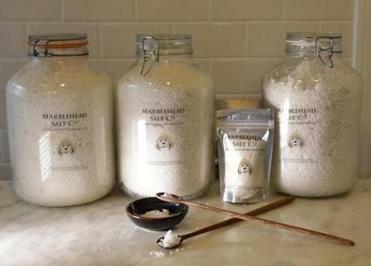 Solar evaporated, unrefined crystal sea salt is milled to a fine, medium, or coarse grain. These are most of the sea salts in the world and range from dry to moist, white to gray. Hard crystals with very little moisture, mined sea salt such as Himalayan and Peruvian pink salts, come from deposits on land rather than the ocean. Flavored or blended sea salts contain herbs, spices, citrus, or other flavorings. Sea salt that is either cool- or warm-smoked over a fire to make smoked sea salt is usually brown in color, with the characteristic smoky taste. Correction: Due to a reporting error, an earlier version incorrectly identified Matthew Tropeano’s smoker. It is a cold smoker.